What, exactly, is chenille? You’re probably familiar with the word “chenille,” whether you dabble in the world of home decor or whether you thrive in it. Pronounced “shə-nēl,” chenille is a fabric made by wrapping segments called “pile yarns” around “core yarns” in right angle patterns. Chenille is feathery and soft, with longer segments resembling woolly caterpillars. “Chenille” actually is the French word for caterpillar! Chenille has been around since the late 18th century; it might not be a novel fabric, but chenille is highly-praised for its unique appearance and cottony texture. Imagine combing your fingers or settling your cheek into the feathery threads of a chenille bedspread! For a simple but cozy chenille bedspread of your very own, look no further than the Chadwick Chenille Bedspread. Sumptuous, tufted stripes cover this cotton bedspread, available in solid colors of green, blue, natural, red, or yellow. A three-inch tasseled border adds elegance. Even the coordinating shams and pillows are ribbed chenille fabric; mix and match colors for striking visual appeal. If you seek a more “ornate” pattern, the Kingston Chenille Bedspread is the perfect fit. 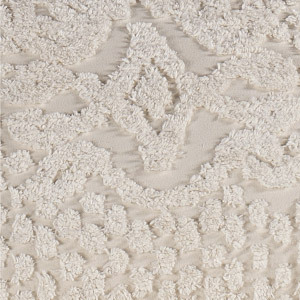 Tufted plumes form a blossoming floral medallion on this cotton bedspread. Like its Chadwick counterpart, Kingston is a solid color bedspread and is available in a soft palette of beige, blue, roses, sage, or white. Its two-inch, tasseled edges delicately skim the floor. Finally, the Promenade Chenille Grande Bedspread lives up to its name with beautiful swag and bow designs that parade around a star and dot motif. Oversized to accommodate deeper mattresses, this cotton bedspread displays a regal but lighthearted air. Tawny, sapphire, and plum allow for sophisticated color possibilities. Cozy and soft-to-the-touch all year round, chenille bedspreads hit a perfect balance between elegant and unexpected. I love chenille bedding, but I have been unable to find my color. I am looking for soft blue, and a soft pink or even soft green. Pastel colors. It would be nice if you could make a two tone color like the comforters. A soft blue/Caramel – A soft pink/blue – A soft green/cream – A soft lavender/cream. Something that no one has tried yet. I have three bedrooms and I would love chenille in all. I also have a son, but he loves the dark colors, black/silver or black/blue (he is a teen). Looking forward to haveing my message answered positively. Working on it!!! Thank You, Ms. Abney. Thank you for your interest in our chenille bedding. We offer several chenille patterns. We do carry some pastel colors, as well as bolder shades and a multi-tone pattern; however, we do not offer black/silver or black/blue at this time. We will pass your request on to our merchandising staff. You may request free fabric swatches for up to three items, which will allow you to see the color and texture before placing an order. Please click on the Swatch tab on the product page for more information. I left the chenille message earlier. I left out to mention, that I do not prefer the ribbed, nor the caterpillar look, nor the promenade look. LOVE the soft plush look. Wish it for many, many years………. Again Thanks so very much.